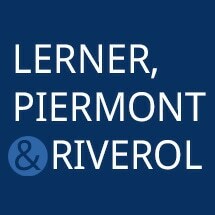 At the personal injury and worker's compensation law firm of Lerner, Piermont & Riverol, P.A., we help people who have been injured in an accident, or as a result of professional negligence. Since 1972, we have committed our practice exclusively to personal injury and civil litigation to help people recover the compensation they deserve when they have suffered harm because of someone else's carelessness, incompetence, negligence or illegal action. Our attorneys have over 100 years of combined experience handling personal injury claims. We are responsive to our clients' needs; take the time to understand the true extent of our clients' injuries and work hard to achieve the best possible outcome in every case. Attorneys from New York City often refer clients to us because of our experience, skillful representation and the effective results we get for our clients. Our firm also handles various residential real estate matters. We represent buyers, sellers and current homeowners in real estate closings, foreclosures and other matters. If you have been injured in an accident, or have suffered because of professional negligence, contact the lawyers at Lerner, Piermont & Riverol, P.A., to schedule a free consultation about your injury or civil claim.